A four-woman delegation from Jordan, including NGO representatives from Karama and its partners the Arab Women’s Organization and SIGI, participated in the Pre-Session Working Group of the CEDAW Committee at the UN this week sharing their concerns and identifying gaps in Jordan’s efforts to implement the articles of CEDAW and uphold the rights of women. 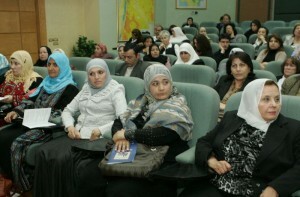 They had the opportunity to present a prepared oral statement and answer questions directly from the Committee members to help frame their review of Jordan in the 51st CEDAW session scheduled for Geneva in February 2012. The right of male relatives to take custody of the children in place of their mother if their father dies. In addition, the delegates raised concerns about women refugees, the rights of domestic workers, and the need to increase the percent of women participating in politics. Pointing to some gains in Jordan, the group commended the enactment of recent laws addressing domestic violence, trafficking, and sexual harassment, however, they decried the absence of mechanisms to monitor their efficacy and implementation. Questions were subsequently posed by the CEDAW Committee, probing further into the precise scope of the new laws, their implementation or lack thereof, and how Arab women believe the Arab Spring will help in promoting women’s rights. The Pre-Session Working Group allows the UN CEDAW Committee to prepare lists of issues and questions for the States scheduled to be reviewed in the next two formal sessions. The participation of Karama’s Jordanian partners and their presentation of a joint NGO brief and oral testimony was pivotal in jumpstarting preparation for Jordan’s formal periodic review in Geneva. The four NGO delegates included women activists from multiple generations and faiths, emulating the social landscape of the Arab Spring, which brought together men and women of different ages, classes, professions, and religions. Our partners in Jordan continue to be trailblazers in the international advocacy arena. This intervention marks the first-time ever that Karama partners have participated in the Pre-Session Working Group of the CEDAW Committee, and will set precedent for future interventions. To read the full Oral Statement, please click here.